I’ve already posted my best for for the first six months of 2017 (well, obviously, not really six months – more like, “up to June”), and you can find it here. But what I usually do is also is work out what I’ve been reading and watching in terms of gender, genre and nationality. Since 1 January, I’ve read forty-nine books, which is down on previous years. In fact, I’m running aroundna dozen books behind on reading challenge this year, and I set my target at 140 books despite managing 150 books last year. In terms of gender, I’ve done quite well, as male and female authors are running neck-and-neck. 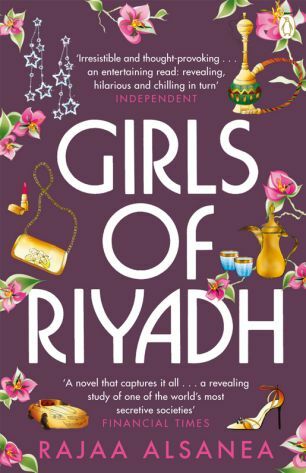 I’ve not always alternated, which is what I try to do, but if I read a run of books by male authors, then I follow it with a run of female authors. I only track this for fiction, incidentally. 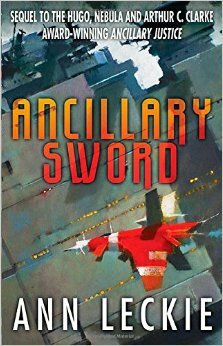 Genre-wise, I self-identify as a science fiction fan, but in recent years I’ve found myself reading less sf… Or so I thought. 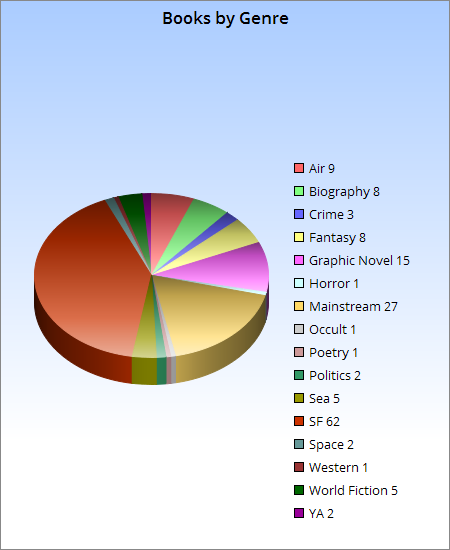 As you can see from the chart above, science fiction has accounted for 59% of my reading in 2017 so far, and mainstream only 13% (although if you add in the world fiction, a new category, it rises to 19% – and yes, I dislike the term “world cinema” but I wanted to track the books I’d read my non-Anglophone writers and “world fiction” seemed the easiest way to do it). 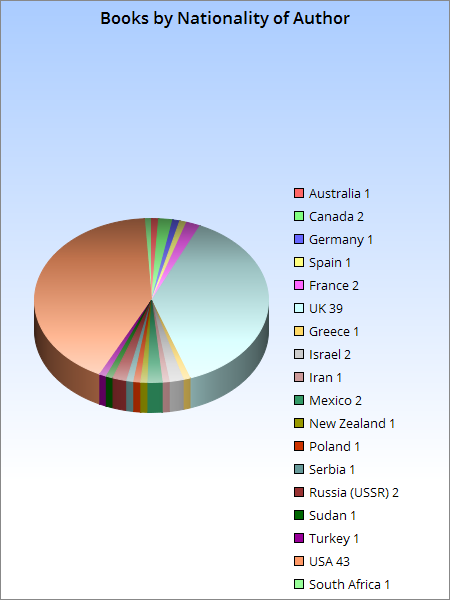 And speaking of “world fiction”, this year I’ve been tracking the nation of origin of the authors whose books I read. 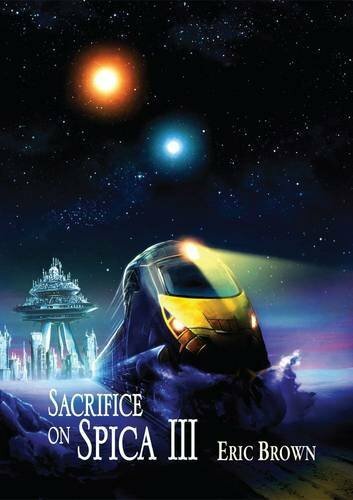 I’d imagined that since I read a lot of sf, most of my reading would compromise US authors, but it seems I actually read more UK sf than US. Quite a bit more, in fact. I’ve also made an effort this year to read fiction from other countries – hence the presence of Albania, Belarus, and Estonia. The Norwegian book was one I’d had my shelves for several years, the Bangladeshi one was the novel from which a favourite film was adapted, the Czech was an author whose books I like and have read previously, and the French ones are all bandes dessinées. 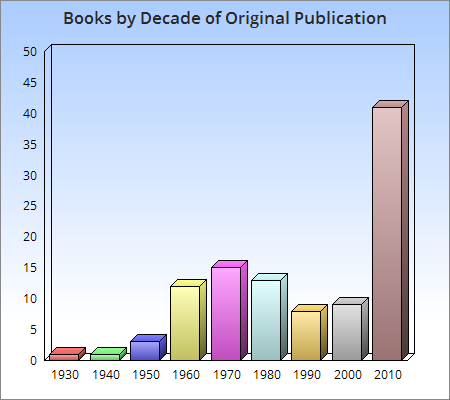 Finally, the decades in which the books I’ve read were published… I never think of myself as someone who always go for the new shiny, so it came as a surprise to see how much books of the last seven years dominate my reading. The 1990s was the decade in which I first became active in sf, so perhaps that accounts for its high showing. I started recording the films I watched back in 2001, although I didn’t bother tracking rewatches of films I’d already seen until a year or two later. And it wasn’t until 2010 that I began noting down the country of origin of the movies. In the last few years, I’ve made an effort to watch more films from non-Anglophone countries – or, at the very least, to reduce the percentage of films I watch that are from the US. 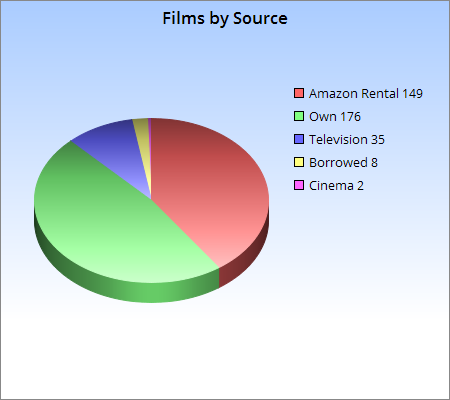 Overall, counting all the films I’ve seen since 2001, US films account for 52% of my viewing. Happily, so far this year, that’s down to 23%. China is next at 13%, and then the UK at 10%. In 2017, I have to date watched movies from thirty-eight different countries: Argentina, Australia, Austria, Belgium, Canada, Chile, China, Colombia, Cuba, Czech Republic, Denmark,Estonia, Finland, France, Georgia, Germany, Greece, India, Iran, Italy, Jamaica, Japan, Mexico, Netherlands, Peru, Poland, Romania, Russia, Senegal, South Africa, South Korea, Spain, Sweden, Switzerland, Taiwan, UK, USA and Vietnam. If I exclude rewatches, the total drops from 266 to 215 movies watched, the US rises to 25%, China drops to 12% and the UK to 9%. So I guess it wasn’t US films I mostly rewatched. I also prefer to spread my viewing across the decades, and not just watch the latest films. But then, I do like me some 1950s cinema… although this year I seem to have watched more 1960s movies. 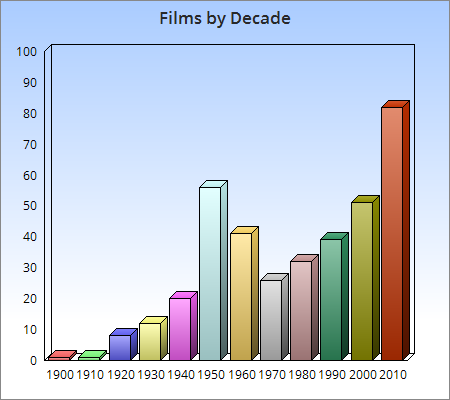 And it’s weird that both the current decade and the last decade score exactly the same at 51 films each. This year, I’ve also started tracking the gender of the directors of the films I watch. I know that most of the films I watch are made by men, but I was a little dismayed at how low the percentage of women director was, even though this year I’ve discovered some new female directors whose oeuvres I’d like to explore, such as Claudia Llosa and Lucía Puenzo. (Incidentally, “pair” means two or more directors, and “series” means television programmes.) Discounting rewatches and other films by the same director, I’ve actually watched films by 176 directors, but only a dozen of them were women. I need to improve that. The genre of the films I watch: I tend to think of most films as “drama”, which is why that category is so big. And “animated” includes anime films, but not Disney ones, which, for some reason I decided to split out into a category of its own. Also, “wu xia” is a bit of a cheat, as not all of the films I classified as that are actually fantasy – some were big Chinese historial epic films. Oh, and I watched a few Elvis movies, so I felt he deserved his own genre too. But only 5% of the movies I’ve watched so far in 2017 were science fiction films… but then I’ve never been that big a fan of sf cinema, although I do rate a handful of sf films pretty highly. Finally, I’ve been working my way through the 1001 Movies You Must See Before You Die list (the 2013 edition) for a couple of years, and so far in 2017, I’ve watched twenty-six films new to me from that list. The results have been… mixed. Some were good, some were merely okay, but none turned me into a fan of the director, as has happened in previous years. To date, I’ve watched 867 films on the list (some of them before I even started recording my film-watching), so that’s 33 to go… I’m unlikely to complete the list this year – I may never complete it, as some of the films are near-impossible to find. But we’ll see. Categories: 2017 roundup | Tags: 2017 roundup, books, films | Permalink. During 2014, I read 149 books, which is up by 1 on 2013. Thirteen of those books were published during 2014. 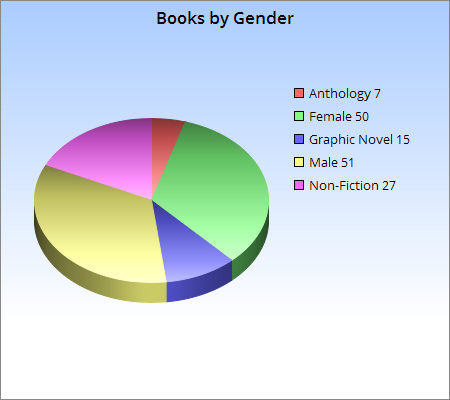 I alternated genders for my long fiction reading, and managed to read 50 novels/collections by women authors and 51 by men. The rest of the books I read were either anthologies, non-fiction or graphic novels (well, bandes dessinées). 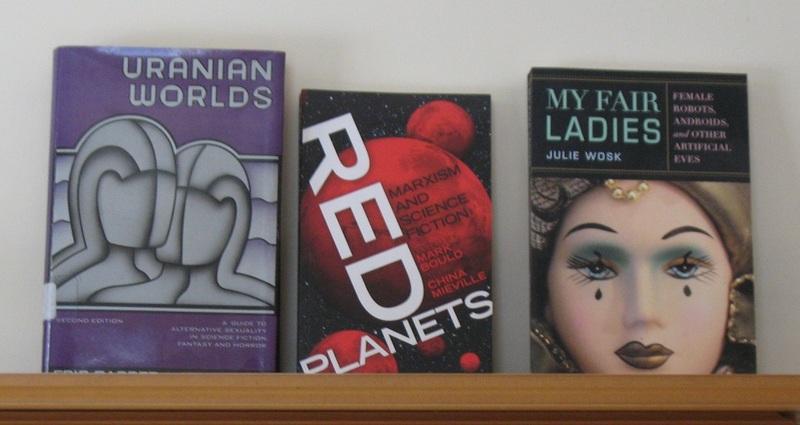 Twenty-three of those novels, collections or anthologies, I read to review on SF Mistressworks. Two were for Interzone, and one was for Vector. The remainder I mostly blogged about here. 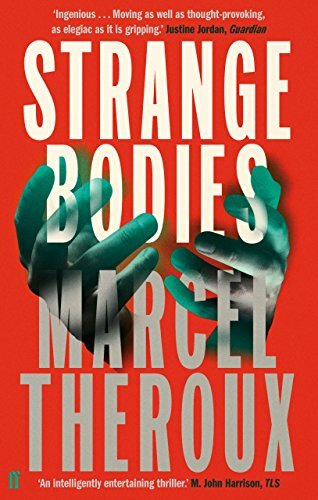 I don’t normally read so much recent fiction, but during 2014 I joined the Worldcon – although I later sold my membership and didn’t attend – which allowed me to nominate works for the Hugo Award. I also managed to read a number of 2014 books during the year. 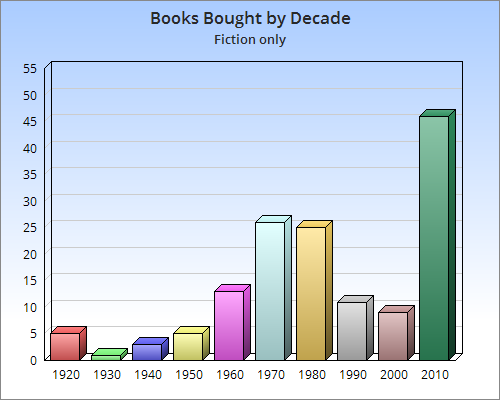 I suspect the high number of fiction books published between 1961 and 1989 is a result of reading for SF Mistressworks. 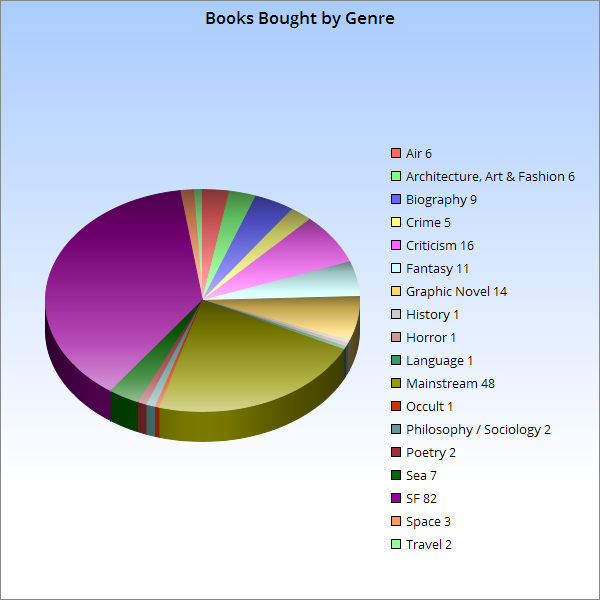 The bulk of my reading was, as is usual, science fiction at 41% – which is less than half, so that’s not too bad – and closely followed by mainstream (or literary) fiction at 18%. Fantasy manages 5% and horror only 1%. I did use a number of books on science fiction criticism and spaceflight as research for Apollo Quartet 4 All That Outer Space Allows, but the only research books I actually read were biographies. I should make more of an effort to read fiction by authors from other nations. 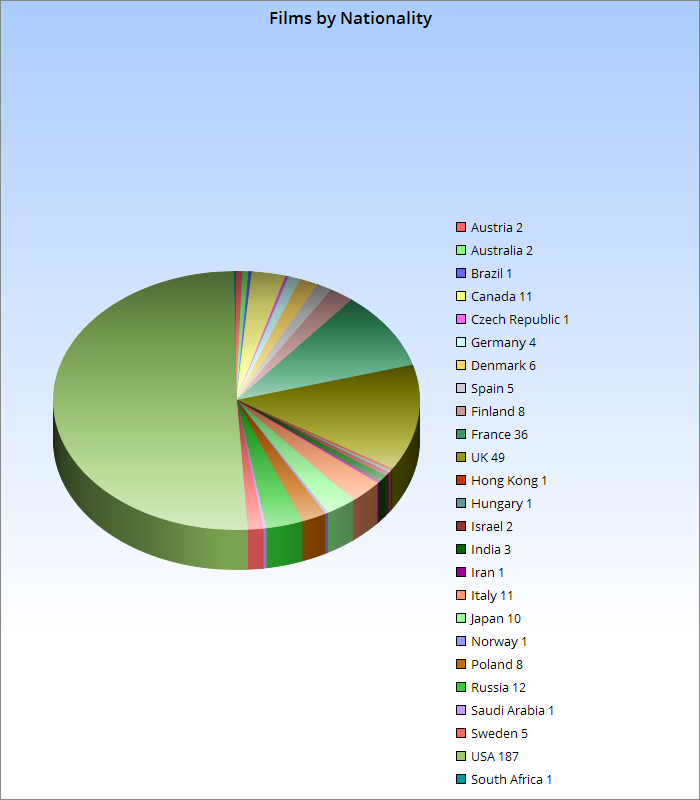 More than three-quarters of my fiction reading was from the UK (38%) or USA (42%). But I did manage to read one or two novels/collections each from a further sixteen countries. During 2014, I purchased – or was given, or sent for review – 217 books, of which 30 were published during 2014 and 23 were better editions of books I already owned. By the end of the year, I’d read 77 of those purchased books (although that figure does include books I’d read in earlier years but had not owned, or had purchased a better edition in 2014). 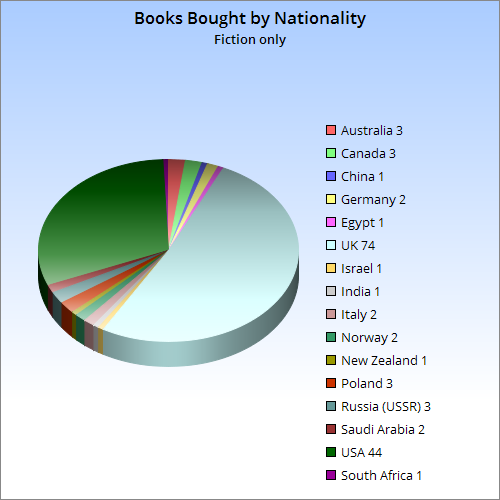 It seems just over half (51%) of the fiction books I purchased in 2014 were by Brits. Less than a third were by Americans. The remainder are scattered across fourteen countries. 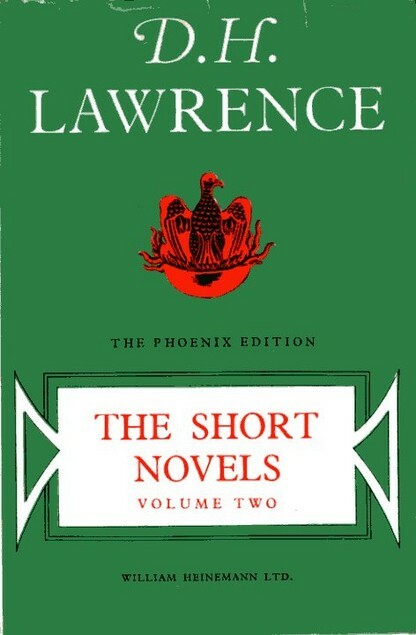 The relatively high number of fiction book purchases from the 1920s is a result of buying a number of DH Lawrence paperbacks. The high number for this decade is due to Hugo Award reading and my habit of buying books the moment they’re released by favourite authors who are still writing. Otherwise, it doesn’t surprise me that the 1970s is the next highest decade, although only just. That’s also likely a result of reading for SF Mistressworks. If I’ve done my sums correctly, I bought 194 new books during 2014 but only managed to read 149. Which means the TBR has grown by 45. Some of those book purchases were for research or reference, so not really the sort of books you read from cover to cover – but still. So far I’m managing to keep the TBR manageable by dumping at charity shops books that I’ve belatedly realised I’ll never get around to reading – but I really ought to make more of an effort to get the humungous TBR down to more realistic levels. At the last count, given my average reading speed, I could probably go for a good five or six years without having to buy another book before I ran out of stuff to read. 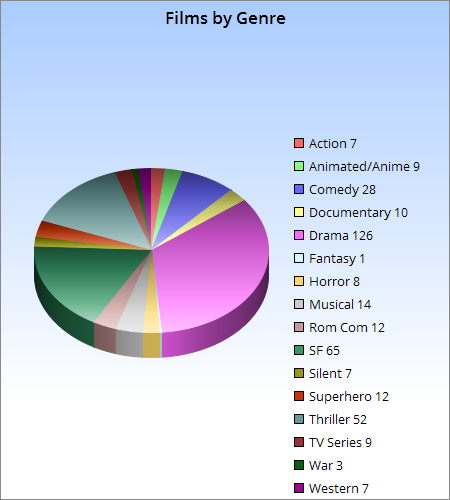 In 2014, I started on a new viewing project: watching all the films on the 1001 Movies You Must See Before You Die list. I’d already seen almost half, but I still had plenty of titles to track down. Mostly, I’ve been using Amazon rentals, but not every film on the list is available there so I had to buy a few of them. As a result, 2014 proved to be, well, a year of lots of film-watching. And I mean lots. By 31 December, I had seen 369 films… which is 182 more than in 2013. Basically, I watched two years’ worth of movies in twelve months. I managed this chiefly because Amazon changed my rental agreement so they sent out replacement DVDs as soon as I returned the ones I had, which pretty much meant I had three rental DVDs every weekend throughout the year (149 in total over the year, in fact). I documented many of the films I watched in fourteen Moving Pictures posts on this blog. I still have one more – the fourteenth – to post. It should go up in a few days. Not every film I watched was any good, but several did become favourites. Around a third were rewatches (29%), and that includes several rewatches of All That Heaven Allows. Ninety-one of the films were from the 1001 Movies You Must See Before You Die list (25%), which puts my final total at 541 out of 1001. Incidentally, the television series category doesn’t include two series I didn’t manage to complete during the year – The Jewel In The Crown (I need to read A Division Of The Spoils before I watch the last few episodes) and From the Earth to the Moon (I rewatched selected episodes as research for All That Outer Space Allows). I’ve long been a fan of the cinema of nations other than the USA and UK – although those two nations do dominate my viewing. In my defence, most of the American films I saw in 2014 were classics. In total, I watched films from 25 different countries. Some films were actually multi-national efforts, in which case I’ve assigned them to whichever nation seemed dominant. The high number of Italian films is a surprise – I hadn’t realised I’d seen that many. Likewise for Russia… although I did rewatch several of Aleksandr Sokurov’s movies during the year. I’d expected Poland to score higher, given that I “discovered” both Piotr Szulkin and Andrzej Wajda during 2014. Denmark’s good showing will be from watching a bunch of films by von Trier and a rewatch of some Dreyer. After claiming I don’t watch much twenty-first century Hollywood product, it seems most of the films I watched in 2014 were from the last four years. Oops. But at least the next highest decade was the 1950s. Altogether, I don’t think that’s too bad a spread. I could do with watching more films from the 1940s and 1970s. Likely I’ve seen most films released during the 1980s – or at least those I’d be interested in seeing from that decade. I’d like to watch more early cinema, but a lot of those films are hard to find on DVD – in the UK, anyway. In fact, the UK’s record on DVD releases is pretty poor. I mentioned Piotr Szulkin earlier – I only got to watch his films because I ordered a DVD box set from Poland. I also bought several Region 1 DVDs, because the films had never been released in this country. And even a couple of Region A Blu-ray discs… only to discover my Blu-ray player was locked to Region B. Argh. That’s something I’ll have to address in 2015. There are even a handful of recent documentaries yet to appear in the UK that I really want to see – Jodorowskys Dune and James Cameron’s Deepsea Challenge, for example. As soon as I get myself a region-free Blu-ray player, I’ll be getting Blu-rays of those from the US. There are also several favourite directors whose oeuvres are incomplete in the UK, but not in other countries – such as Douglas Sirk, Aleksandr Sokurov, Andrzej Żuławski, Miklós Jancsó or Sergei Parajanov. Having said that, much praise to the BFI and Second Run DVD for continuing to release excellent films on DVD and Blu-ray. Categories: 2014 roundup | Tags: books, films | Permalink.